Owning to its excellent properties of tungsten such as high density with small volume, high melting point, excellent hardness, superior wearing resistance, high ultimate tensile strength, high ductility, gold-plated tungsten alloy rod and tungsten alloy golden rod could be regarded as the special present for some fields. Gold-plated tungsten rod, tungsten alloy golden rod have similar surface of gold, which is smooth and bright as copper mirror, which it is able to reflect the images next to it. With the similar gold color, it is usually very attractive and pleasant to eye, and be fond of many people. If you are working in an international enterprise, a broker in stock or manager in a big insurance company, you can use gold-plated tungsten alloy rod or tungsten alloy golden rod engraved with your company's name as souvenirs or present to your VIP customers. It is a very decent present without costing too much, and also could attract more customers for your business. Tungsten alloy golden rod,gold plated tungsten alloy rod also could be used as a part for handicraft. If you are a gold dealer and attend some trade fair or put your gold products in the showcase, what you want least is your gold products are stolen. However, your shining gold products are always very attractive to the thieves. In order to reduce any possible great loss, you'd better to put a fake, but a very similar substitute for gold products. 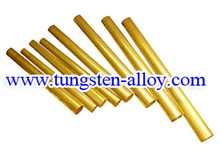 Tungsten alloy golden rod or gold-plated tungsten rod are the best choice. 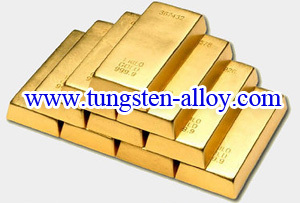 Chinatungsten can not only offer tungsten alloy golden rod, gold-plated tungsten alloy rod as per normal requirement, but also can offer gold-plated tungsten rod, tungsten alloy golden rod with engraving for gold substitution. Notice: Chinatungsten Online (Xiamen) Manu.& Sales Corp. is a very professional and serious company, specializing in manufacturing and selling gold-plated tungsten alloy rod, gold-plated tungsten rod for more than two decades. Our product and tungsten alloy golden rod are only for souvenir and decoration purpose. Here we declare: Please do not use our gold-plated tungsten rod and tungsten alloy golden rod for any illegal purpose. If you are interest in tungsten alloy golden rod or gold-plated tungsten rod, please feel free to contact sales@chinatungsten.com sales@xiamentungsten.com, or telephone 86 592 512 9696.